There's some confusion around the appropriate steps to take in adding an Xbox 360 to a home network with optimal results. In an ideal universe, connecting an Xbox 360 with a wired connection is the best course of action. Wired connections generally guarantee close to 100Mbps per machine across a local area network. Wireless networking is significantly less reliable, with things like cordless phones and microwave ovens operating on the same frequency as the 802.11b and 802.11g standards. 802.11a is the standard Microsoft is recommending, but it's not necessary. My own home network is segmented with an Xbox 360 on one 802.11g access point and all other wireless devices are on a second 802.11g access point. My wired Media Center successfully streams the 1080p HD content available from Microsoft's WMV HD Showcase without any hiccups. If you currently live in an 802.11b wireless network world, it's definitely time to upgrade. 802.11b results in lousy streaming of audio using Windows Media Connect and most of the existing hardware won't support the WPA security standard you should be using to protect your network. If you live in a house like mine, with one portable machine stuck with onboard 802.11b, you definitely want to segment your 802.11b traffic from the Xbox 360 802.11g traffic to prevent a slowdown in gaming or streaming performance. 802.11g networks also benefit from network segmentation. Put the Xbox 360 on its own 802.11g access point and connect all other wireless devices to a second access point to keep network performance optimized. This is like making the Xbox 360 the lone car on the expressway while all your computers are stuck in traffic over on the highway. The first part of the process is to get a second wireless router. In some cases it might be easier to purchase a router of the same brand as your first router, but this is by no means required. I have successfully created a segmented wireless network using two D-Link routers, 1 D-Link and 1 Linksys router, 1 D-Link and 1 Belkin Router, and 1 Linksys and 1 Belkin Router. Regardless of which two routers you choose, following the steps below results in an Xbox 360 safely on its own network segment offering maximum throughput for gaming and streaming audio and video. After acquiring two routers, you need to make a few configuration changes to get everything working properly. For best results, use a wired connection during the configuration process. In most cases, Router A will be the existing router currently connected to your Cable or DSL modem. This router should provide DHCP addressing for all computers on your network (including the Xbox 360). Ideally you want WPA encryption turned on for wireless routing to secure any data sent across the network. This is probably the router you want to connect the Xbox 360 to because it is the closest router to the Internet connection. Router B is the second wireless router on your network. This router will serve only to connect wireless devices to your network, with all network traffic ultimately passing through the WAN connection on Router A to reach the Internet. 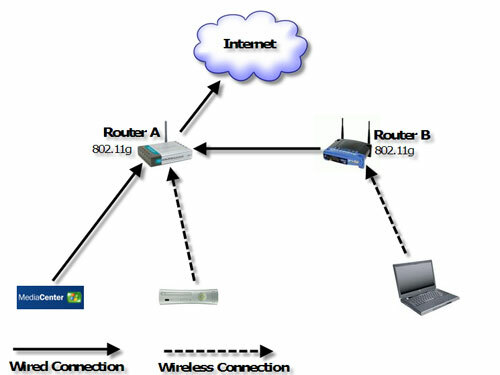 After making the necessary configuration to each router, the last step is connecting Router B to Router A. Connect an Ethernet cable from any of the wired ports on Router B (not the WAN) to any of the ports on Router A. Make a wireless connection to Router B to test your Internet connectivity and you should be good to go. Each wireless access point creates the equivalent of a single wired connection to your router. The more computers you connect to a single access point, the more you fill up the available connection, potentially resulting in an overloaded connection. By putting the Xbox 360 on it's own access point, you are providing the full capacity of that access point's available bandwidth. Don't set Router A and Router B too close together or you will get potential signal interference from the 802.11 signals. Even with the routers on different channels there is still potential for interference. Change the default password on your router because they are always blank or something very easy to guess. If someone in your neighborhood goes snooping for routers, you may end up with a hijacked router. Keep your router away from 2.4GHz cordless phones and the kitchen microwave. If you currently own a 2.4GHz phone, consider replacing it with either a 5.8GHz model or with the older 900mHz variety.